Just back from the Lesser Prairie Chicken Festival in Woodward, Oklahoma (it’s still going on today) and I’m in sleep-dep recovery mode so this’ll be slightly brief and not especially coherent. Let me just say it was a blast and put it on your calendar for next year. Highlights: 1) sharing a blind with Sharon Stiteler a.k.a. Birdchick and Tim Ryan of From the Faraway, Nearby. For four very intimate early morning hours we watched, filmed, photographed and (I) sketched the most wonderful front-row show of lekking Lesser prairie chickens, who are a truly delightful visual and auditory treat. 2) marking the barbed wire fences with clip-on white vinyl tags, a group activity that can help save these endangered birds, who fly into unmarked and virtually invisible fences. It turns out that barbed wire fences are a very large cause of mortality in lesser prairie chickens, and there’s a lot of unmarked fence in their limited habitat. Nice to get to do some actual good instead of just wringing the hands, plus it was good fun with a great bunch of birders. 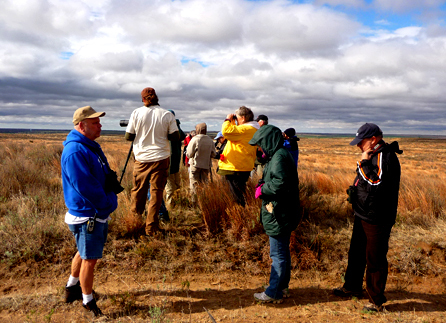 3) Sue Selman’s ranch breakfast for hungry, happy birders following the lek watch. Heaping helpings of scrambled eggs, bacon, biscuits and gravy and lots of hot coffee. A big pat on the back to the Oklahoma Audubon Council for putting this together and thanks to Sue Selman for opening up Selman Ranch and her very excellent lesser prairie chicken leks to the public. What a privilege and and a joy to get a closeup look at another one of natures grand spectacles! 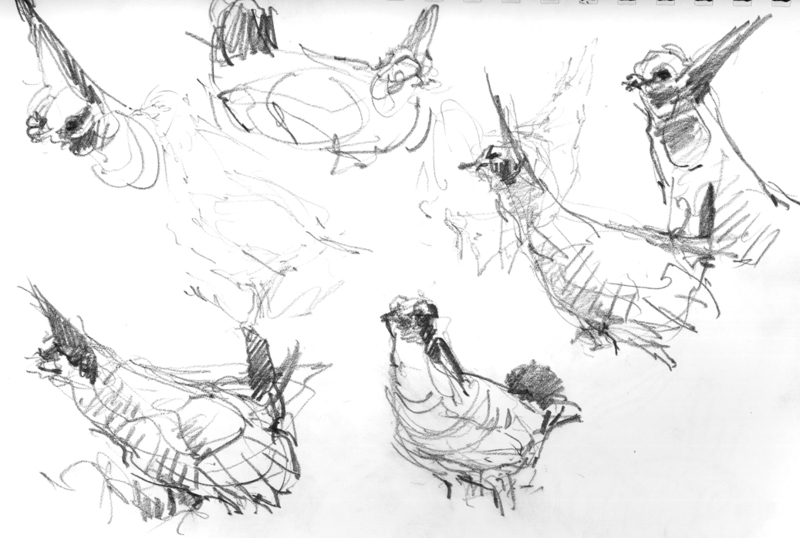 Lesser Prairie Chickens, sketched from inside a blind at their lek at the Selman Ranch near Woodward, Oklahoma. 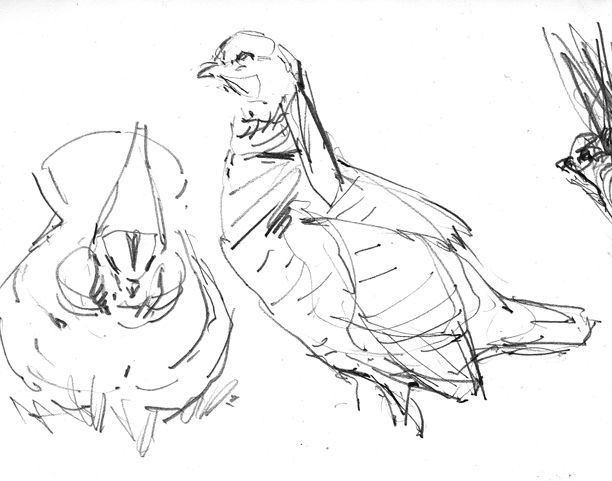 Sketching from a blind is the way to go for skittish and utterly compelling birds like the Lesser prairie chicken. Lesser prairie chickens, drawn from a blind at their lek during the Lesser Prairie Chicken Festival in Woodward, Oklahoma. I’ll leave you with this (humble little) video I made of the lekking chickens. Birdchick got some thoroughly awesome videos- you will definitely want to go on over and have a look. I enjoyed the video as well as the sketches. Not quite as good as being there but still a lot better than just reading about it. I have to confess also that I really have a fondness for quick sketches like this that try to capture something that is alive and not posing for the artist. I suppose many would find them too crude but I love the sense of life, or life grabbed before it escapes or changes, that they have. What a treat! You did a great job showing this to us. The prairie chickens are so funny when theuy raise their neck feathers. They seem to display a bit different then the one I saw in Utah. What a priviledge to do this and how wonderful that you could do something to help the birds! Sweet Dreams! Beautiful quick sketches! They feel alive. 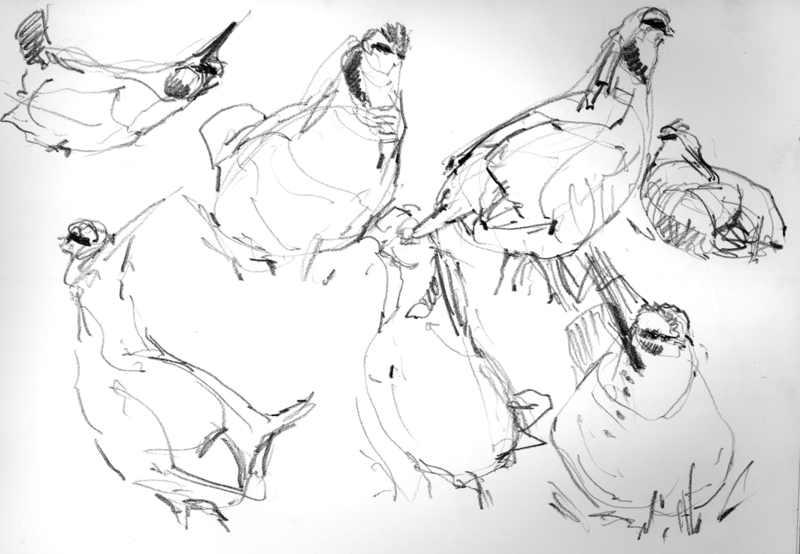 I remember sketching prairie chickens on a trip to Colorado: most of the sketches were done in the dark. It was good, though, because I didn’t spend time worrying if I was getting them right: I just made my pen follow what I saw. Some weird but wonderful results. I love yours and agree: these birds are alive! I did some of these in the dark, too. I bet your sketches were great, Pica. These are stunners. I’m liking your site a lot; I’ll be back. I asked a few friends for help in changing my email addy because I don’t like it. I gave them some options to select from. All of them had motmot in them. A friend responded by sending me your url. So, now I have to use another bird because your site is so cool. Thanks for the video. Wish I could have been there. I was getting up close and personal with red pandas at the Knoxville Zoo. Ya know, for my birthday a couple of weeks ago I was rudely awakened by a battery-operated, faux-fur covered leghorn doing a stiff-legged electronic chicken dance.